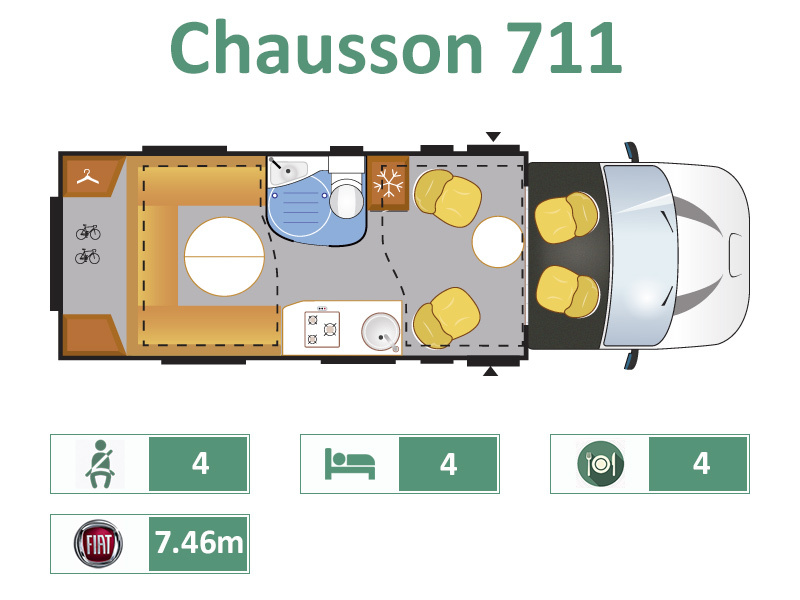 The 711 Travel-Line is 7.5 metres of uniqueness, with habitation doors on both sides you can let yourself in on one side and out on the other ! .. Ideal if your travels take you across the UK and beyond where they drive on the opposite side of the road. Park either way around on the camp-site to optimise your view ! The layout is a traditional one in some ways with a large rear `U` shaped lounge, with cupboards and wardrobes .. the storage is excellent, with a drop-down double bed above, that can be brought all the way down. The forward lounge features 2 x Captains Chairs and a removeable coffee table. There is a mid-kitchen and mid-washroom, and a large rear garage.